Originally uploaded by Pixel Letch. 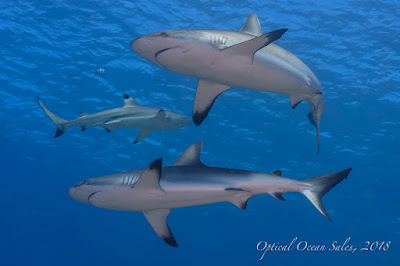 I snuck out for a day of diving off The Peace in Ventura while on a family visit to So Cal. Most Wednesdays they run a long trip that leaves on Tues night and goes to San Miguel or the oil platforms or someplace cool. A bargain at $90 for 4 dives, air and 3 very square meals, snacks, etc. The Peace diveshop can arrange to have whatever rental gear you need delivered to the boat, ready to go, as was the case with my HP100 tank. We were lucky to have calm conditions. My friends had tried for three times to get out to this location and were turned around by bad conditions. The skipper Eric told me that with almost any wind it becomes very rough. The boat left Tuesday night at midnight for the long run out, which was uneventful and allowed for most to get some sleep. Fellow photographers Matt and John are definitely gear heads, oh ok, I'm jealous of their DSLR systems. But I'm gonna start wearing garlic around my neck when I'm around John, I don't want to pick up his gear failure karma. He blew up another ($700) DS-125 strobe and had his seals fail on his drysuit (they repaired 'em with duct tape and PVC cement for the day!). Arrgh, too late, I've had a screw to my latch strip on my camera housing. Lucky it didn't interfere with my dives. difference between San Miguel and Santa Cruz. Very similar water temps (56F) to Seattle. But it's definitely California, as I had several inquisitive sea lions check me out, I think they were intrigued with the HID light. I should of gone with Nitrox, as on the last dive I went into deco and had a 6 min obligation, even though I stayed at 50' (oh ok, it was for 55 mins). I forgot that a lot of the dives are a pretty square profile here, not much shallows to end your dive on. The Peace is a great boat, wonderful crew, lots of food, very comfortable - even with a crowd of 23 divers. There's bunks down below for the 7 hour boat ride each way. Even has a small hot tub! Sure could use a dedicated camera table. I had a lot of fun with my Fuji F810/Ike housing/Ike DS50 system. I just shot macro. 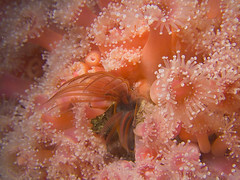 After 6 dives I'm finally starting to get more consistent with my focusing with the Inon macro lens. Hard for an old fart like me to focus with only 1/2" depth of field and surge, even with the viewfinder magnifier.